Our younger daughter, Sasha, who is now nearly eleven, is autistic. She was diagnosed with autism at the age of two and a half. This picture was taken back in 2013, when the girls were aged 8 and 6. Snapped spontaneously on an iphone, it is still the best capture of the three of us together. I'm not sure we'll ever get another one this good! I love the twinkles in the girls' eyes. The day autism was first suggested to us is the day I started this blog, over eight years ago. 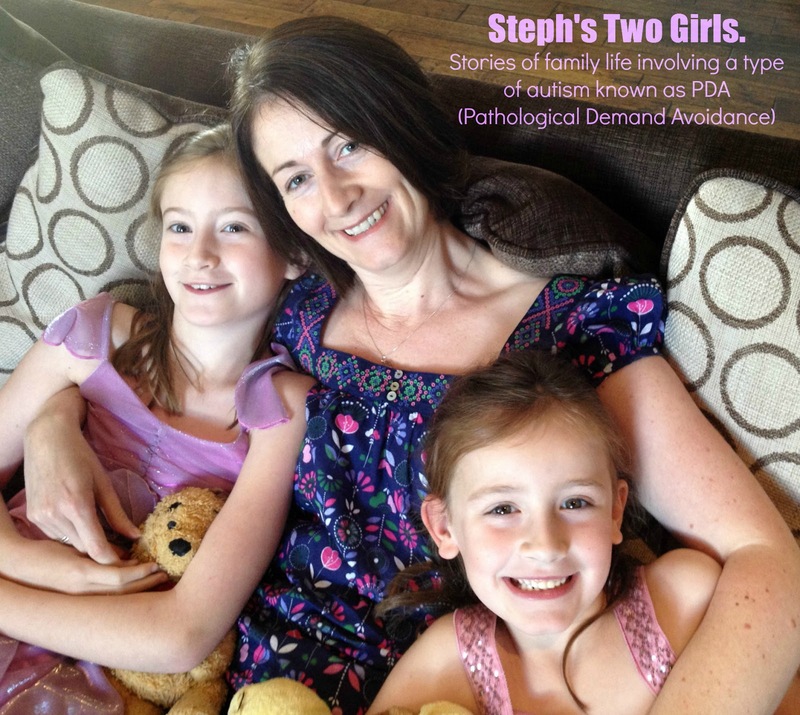 It began as an online diary to try and get the jumbled thoughts out of my head, but has grown into a means for me to share the words Pathological Demand Avoidance with as many people as possible. Please do read my post 'What Is Pathological Demand Avoidance....?' to learn a little more. I write this blog to try and help others understand; in a selfish way, I hope that this will make my daughter's path through life a little easier. It was momentarily tempting to write that her life will be more difficult than that of other children her age. However, that's simply not true. Some of the challenges she faces may be more difficult because of her autism, but there are no doubt many other children who have far greater challenges in their lives. This is not a competition though. I've always been a firm believer in PMA (positive mental attitude) and that we all need to concentrate on making the best of our own lives. Whatever the ups and downs. We don't know what the person passing us on the street has had to deal with last night, last week, last year or for their entire lifetime. We can never know that about anyone. That doesn't mean we can assume all is well; it does mean that we should never judge. So why am I happy that my girl is autistic? She is her, she is who she is meant to be. Yesterday she came into the room where I was writing a post about the programme 'Are You Autistic?' and she glanced at it over my shoulder. Unusually for her, she asked what my post was about - Sasha doesn't start or engage in many conversations unless they are a topic of her choosing. I explained that it was my views on a programme which had just been shown on TV, which had been presented by some autistic females. I then briefly pointed out that it had discussed in depth the issue of autistic females trying to 'mask' to fit in and not be seen as being different. 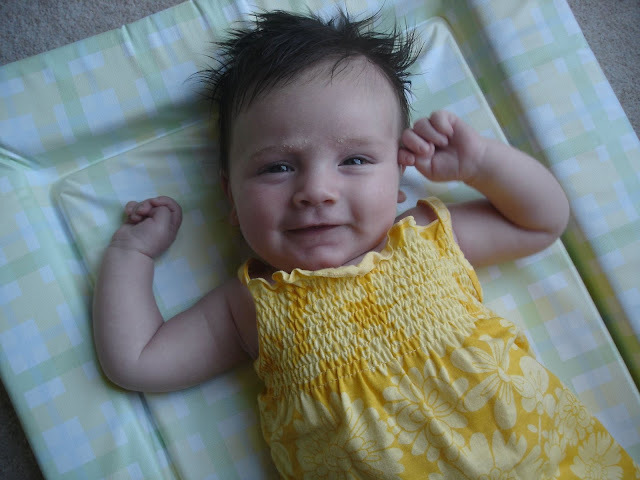 Sasha as a baby; she was happy then too! If you ask parents of autistic children what they hope for most when their child grows up, there are two main words which crop up again and again. Happy and independent. At this point we obviously cannot say if or when Sasha will ever be independent but we do know that it would depend a lot on her being happy. Right now, if she is being herself, and she is happy with that, then I am happy. I can't imagine that many people who are trying to be someone they aren't, or who are masking, are truly happy. I'm happy that my girl is autistic because she has opened my mind to so much. I have found patience within me that I never knew I had. Friendships have been put under a spotlight and there has been a realisation that those that matter, care. We have been so lucky that family has been supportive and come on the learning journey with us; we know this is not the case for everyone, sadly. Of course, life is not always rosy. Right now, I can hear Sasha getting frustrated in the room next door, partly because she is hungry but is refusing all food apart from her favoured peperami sausage snacks. The other cause of her frustration is that she is playing her favourite Nintendo Kirby game and she gets annoyed when she can't achieve as much as she wants to. A typical reaction for many but the extreme emotion which she expresses can be heartbreaking. From my work with other parents of children with Pathological Demand Avoidance, and the series of experiences which have been shared in 'Our PDA Story', I know that there are many families struggling with even more extreme emotions and often this results in violence. Whilst PDA strategies can be used to help in some way, they won't automatically make life easy for everyone. We are extremely lucky that Sasha's frustrations have not driven her down a path to mental health issues, yet. We have to remain vigilant on that front; as I've mentioned already, conversation is not something she enjoys. For now though, Sasha is happy, and vibrant, and entertaining. As a proud mum, I expect everyone who comes into contact with her to love her. I'm happy that she is different, just as I'm happy that her sibling is becoming a typical teenager. I want the world to know that autism is not something to be afraid of; rather it's a brain wired differently, a different operating system, however you want to phrase it. We are all individuals, we all deserve to be listened to and respected. Autism rocks, as far as I am concerned.